Our reading nook in MAKESHOP has been a bit overcrowded for a while now. Owning too many books is a good problem to have—the trick is making room to store them all. Last month, we decided to begin building a new bookshelf. This quickly turned into a passion project for many of us. Working on it has made me think a lot about the way in which memory and collaboration add to a project. I’ve now been working in MAKESHOP for about three and a half months, but I’ve been woodworking in a casual way for much of my life. My dad is a woodworker, and when I was young I used to love watching him saw and shape and finish. The sawdust smell coming from the basement changed depending on the project—sometimes it was clean, sweet cherry, other times earthy walnut. I could tell when he’d get near the end of a piece because the window vent near the driveway filled the air outside with the sharp smell of stain and shellac. 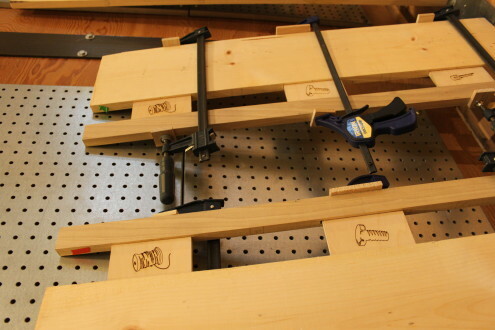 I always helped my dad with basic stuff like gluing biscuit joints, tightening clamps, ripping boards. Watching him do things like cut dovetails or plane table legs was boring to me back then because those processes are time consuming. Even on projects I worked on more recently, my interest was mostly in the finished product, and I never bothered much with actual joinery—drywall screws are definitely faster, if far less elegant. We deliberately chose joinery as the main method of attachment for our new bookshelf; the only hardware involved is the brads holding on the shelving rails. Joinery takes patience and precision. The cuts you make are irreversible. Once you cut a channel or dig out a mortise it’s essentially there forever, so you have to really pay attention to your work (this is also the reason I repeated “measure twice, cut once!” for myself and others probably a hundred times over the course of our project). Even when my work wasn’t perfect, knowing I had done even a little to help my dad was always rewarding. 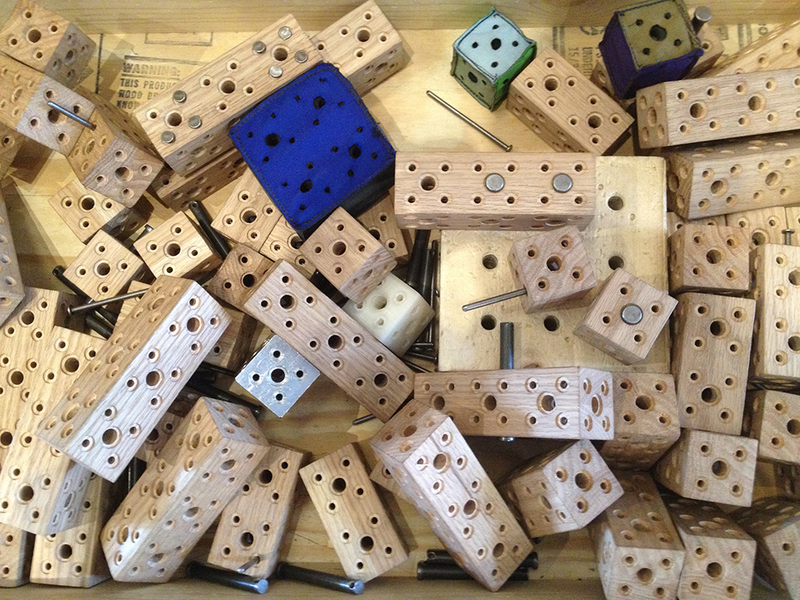 We in MAKESHOP always try to pay close attention to the process itself as something joyful and instructive. 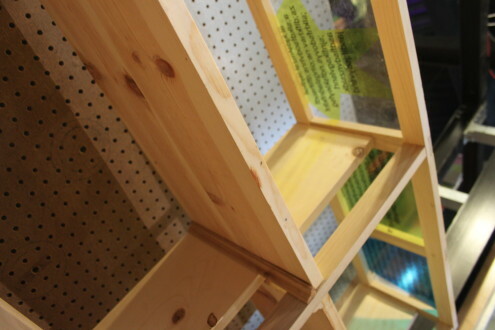 Our bookshelf reveals, as so many things in MAKESHOP do, the process of its creation. You can see the sanded-down heads of dowels peeking from the middle of our half-lapped joints. The laser-cut plywood panels up the side reveal their layers like the rings of a tree. They’re glued into hand-carved mortises that also let you peek at the back of the shelving rails and will, when the shelf is filled, show a preview of the books within. 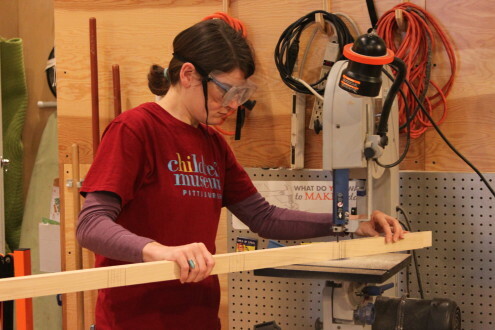 We kept woodworking out in the Workshop for longer than it was listed on our calendar in part because we were all so excited and wanted to keep up the momentum, but the real plus side of this was having lots of families come through and stick around to use tools and help us out while they shared their stories. Making never occurs in a vacuum. Obviously, we want our young visitors to work under their own power and design their own projects. There’s something to be said, though, for the father who recalls his grandmother’s cross-stitching while he helps his son tie a knot, or for the aunt who helps her nieces wire up our circuit block generator while she remembers tinkering in her grandpa’s garage. Nostalgia is and should be part of the process. The stories we remember and the things we learn from others in our lives add value to the experience of making. Some of our visitors cut pieces now integral to our bookshelf. Others worked alongside us—this past weekend, one girl spent a good hour building her own miniature bookshelf while her mom watched and gave her pointers. It made me think of the little bench I built with scrap plywood in the basement with my dad. 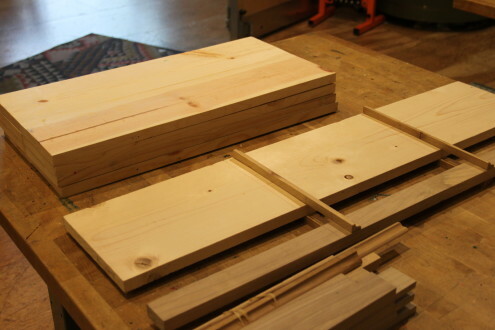 I thought of home, too, as I sat across from my coworkers on Saturday sanding out the channels cut into the pieces of our top frame, the pine warm and fragrant under the grit. I felt a little sentimental after two young visitors helped me glue up the last joint. As I am wont to do with lots of our collaborative projects—our November tiny neighborhood comes to mind—I find myself staring at our handiwork, taking in the seams, running my hand over the side, knocking on the poplar top. Every time I do I remember a different part of the process and think about what I learned as the project grew. I sent my dad photos as the project progressed and even got to show him the shelf during a brief visit to the museum. Like makers young and old, it’s fun to show off what you’ve accomplished and share your excitement with someone else. Above all, it was great to demonstrate how much my past informed my present work. 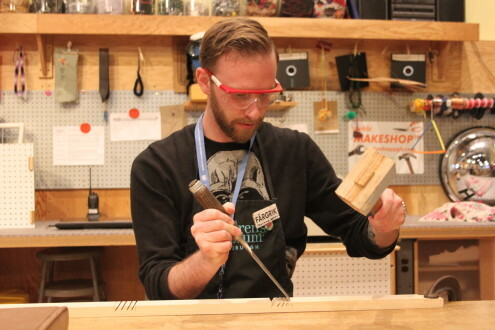 Many of our older visitors did just this, recalling their high school shop class as we helped their kids learn to use a saw for the first time. When we talk about our past, we reveal something essential about our process and our progression. In a way, I think the memories our visitors shared are now as essential a part of our bookshelf’s joints as the glue holding the poplar and pine together. Join the Educator Mailing List to be the first to know when spots open for registration!